The history of plate convergence in southern and southeastern Sundaland recorded subduction of oceanic plate during Jurassic to Late Cretaceous started from Meratus, Bantimala, Luk Ulo, to Ciletuh. The geochronology of subduction is based on subduction-related high pressure to ultra/very high pressure glaucophane schists and eclogites. 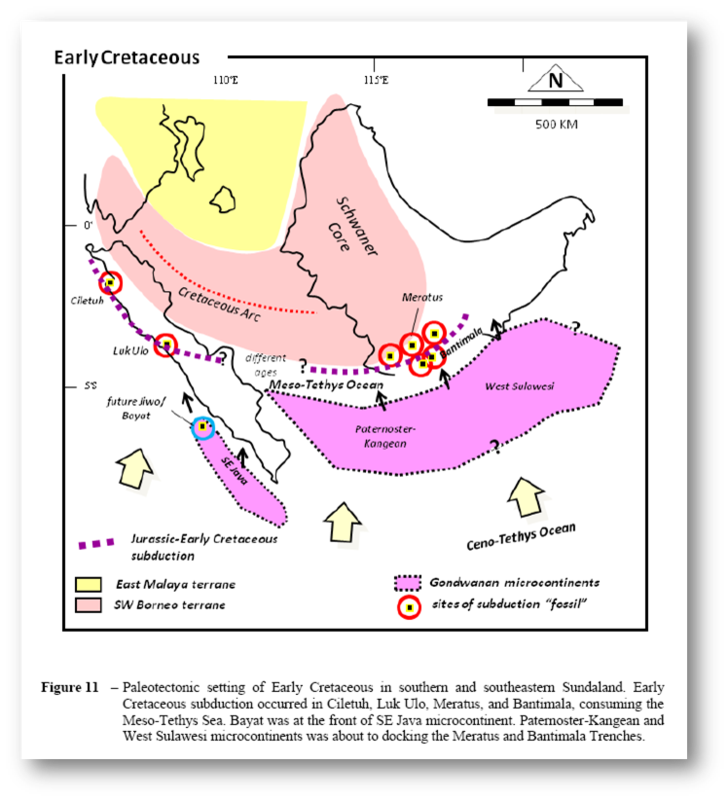 Subduction chased in Bantimala and Meratus trenches in mid-Cretaceous due to docking of West Sulawesi and Paternoster-Kangean microcontinents, respectively. During the Late Cretaceous, subduction migrated to Paternoster trench resulting in volcanic and magmatic rocks as well as forearc sediments in Meratus and Bantimala. In Paleogene time, Meratus and Bantimala separated by the opening of the Makassar Straits, sitting on Paternoster and West Sulawesi microcontinents. Subduction in Ciletuh and Luk Ulo continued into the Late Cretaceous, but possibly with different characters of subduction compared to that of Early Cretaceous due to the absence of Late Cretaceous subduction-related metamorphic rocks. Jiwo Hills, Bayat which has been considered as the continuation of Luk Ulo, is considered not to compose the subduction zone due to the absence of subduction-related rock assemblage. The mid-Cretaceous glaucophane schist of Bayat may relate with docking of SE Java microcontinent in this area. Eocene shallow marine Wungkal-Gamping carbonate shows that Bayat is different with Luk Ulo and Ciletuh which in Eocene were characterized by slope trench olistostromal deposits of Karangsambung and Ciletuh Formations, respectively. Configuration of plate convergence during the Cretaceous implies petroleum possibilities of southeastern Sundaland related to the presence of some Australian-origin microcontinents. Newly acquired deep seismic data in south offshore East Java, eastern East Java Sea, and South Makassar Straits show the presence of Mesozoic-Paleozoic bedded horizons typical NW Shelf of Australia which are proven to be productive or other proven prolific Australoid microcontinents like Bintuni, Seram, or Buton. Pre-Tertiary petroleum system may develop in southeastern Sundaland.